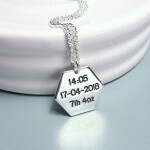 A modern, geometric sterling silver necklace for men comprising of a hexagon shaped charm personalised with hand and footprints and baby's name and birth details. 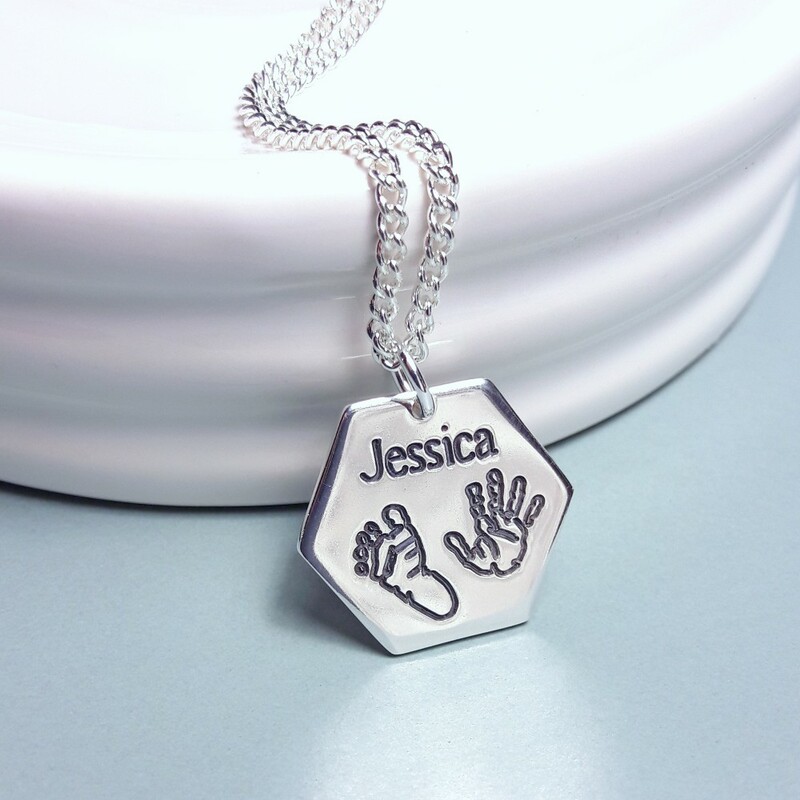 A simple but stunning hexagon beautifully etched with baby's name and hand and footprints. 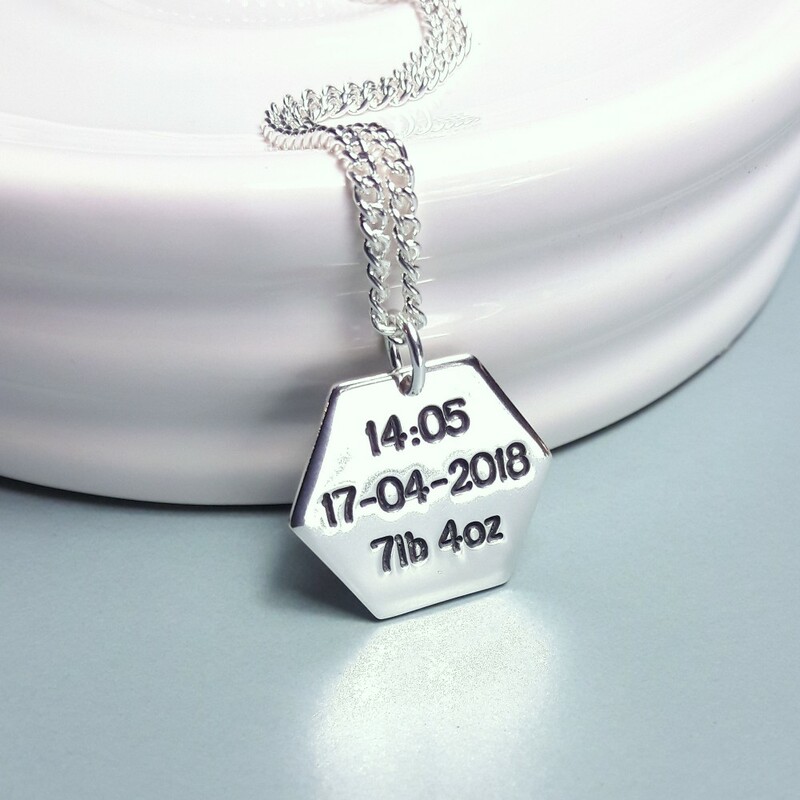 On the reverse of the necklace you can add the date of birth, time of birth and birth weight as a special reminder of those important details. A super modern necklace following the current trend for geometric shapes that is great for everyday wear. The silver hexagon is cut from sterling silver sheet with the text and image beautifully etched deep into the silver. On the front of the necklace you can have a name and a choice of a handprint and footprint, or just handprints or footprints. Please note these are generic images for the hand/footprints so there is no need to send through your own prints. The reverse of the charm is personalised with baby’s date and time of birth and weight. You can choose to have the personalisation oxidised (blackened) or left a natural silvery/white. The hexagon charm is suspended from a heavy weight sterling silver curb chain which is available in a number of different lengths to suit each individual. Additional silver hexagon charms can also be added to the necklace if required to create a cluster.